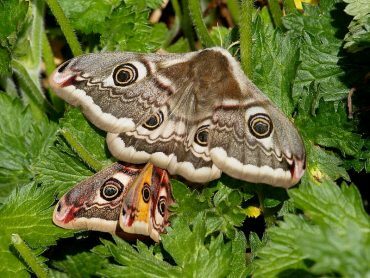 The Elephant Hawkmoth and Small Elephant Hawkmoth, two of the most colourful moths to be found in the British Isles, were attracted to light last night. Although both species are relatively common throughout most of the British Isles they are not so often seen together. Where as the larger Elephant Hawk-moth is a regular visitor to urban gardens the Small Elephant is locally restricted to more open countryside. For those unfamiliar with these species seeing them together provides the opportunity to note how much larger the Elephant Hawk-moth is than the appropriately named Small Elephant Hawk-moth. When seen singularly under the harsh, colour distorting light of an MV light identification may not be instant for everyone as its not always immediately obvious what a difference in size there is. The pink and subtle olive greens may appear similar at a glance but upon closer observation there are distinct differences in pattern. One difference that some find useful is that the olive green abdomen of the Elephant Hawk-moth has a broken pink stripe running down the middle which is absent from the abdomen of the small Elephant Hawk-moth. More Hawk-moths and their caterpillars can be seen in the gallery pages.